By Fuller was born in 1927 in Quitman, Mississippi. He enlisted in the U.S. Navy on July 14, 1945, and served as a Fireman aboard the destroyer USS Waldron (DD-699) from October 1945 until he left active duty on August 6, 1946. He remained in the Naval Reserve until receiving an honorable discharge to enter the U.S. Naval Academy on July 8, 1947. He graduated with a commission as an Ensign in the U.S. Navy on June 1, 1951, and then remained at the Naval Academy as an instructor until October 1951. Ens Fuller next completed flight training and was designated a Naval Aviator on November 7, 1952, followed by service as an F4U-4 Corsair and F9F-5 Panther pilot with VF-192 at NAS Moffett Field, California, from January 1953 to November 1955. His next assignment was with the Combat Information Center School at NAS Glynco, Georgia, from November 1955 to December 1958, and then as Flag Lieutenant for Carrier Division Seven from January 1959 to April 1960. LCDR Fuller next attended A-4 Skyhawk Replacement Air Group training with VA-126 at NAS Miramar, California, from April to October 1960, followed by service as an A-4 pilot and Operations Officer with VA-55 at NAS Miramar and then at NAS Lemoore, California, from October 1960 to February 1963. He then served as a Junior Officer Detailer with the Bureau of Naval Personnel at the Pentagon from February 1963 to July 1965 before attending Armed Forces Staff College at Norfolk, Virginia, from August 1965 to January 1966. CDR Fuller served as Executive Officer of VA-44 at NAS Cecil Field, Florida, from February to August 1966, and then as Executive Officer of VA-76 at NAS Lemoore from September to November 1966. He then served as Commanding Officer of VA-76 from December 1966 until he was forced to eject over North Vietnam and was taken as a Prisoner of War on July 14, 1967. After spending 2,061 days in captivity, Capt Fuller was released during Operation Homecoming on March 4, 1973. He was briefly hospitalized to recover from his injuries at NAS Jacksonville, Florida, and then attended the University of Florida from September 1973 to March 1974. After completing Prospective Officer Training, Capt Fuller served as Commanding Officer of the fast combat support ship USS Detroit (AOE-4) from August 1974 to November 1975, followed by the Senior Officer Ship Material Readiness Course at Idaho Falls, Idaho, from December 1975 to July 1976. He next served as Commanding Officer of the aircraft carrier USS America (CV-66) from August 1976 to April 1978, and then as Deputy Director for Operations for Reconnaissance and Electronic Warfare and Director of the Joint Reconnaissance Center on the staff of the Joint Chiefs of Staff in the Pentagon from May 1978 to April 1980. 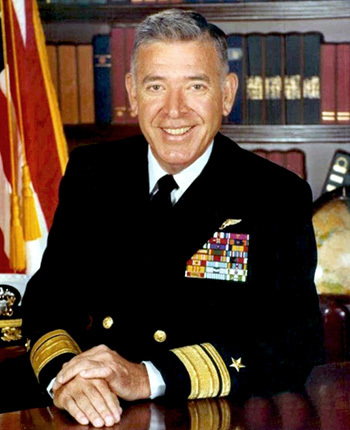 RADM Fuller's final assignment was as Commander of Carrier Division Four from June 1980 to February 1982, and he retired from the Navy on December 1, 1982. During his Naval career, Adm Fuller amassed 6,710 flying hours, 110 combat missions in Southeast Asia, and 640 Carrier Landings. For extraordinary heroism as a Prisoner of War (POW) in North Vietnam during the month of October 1967. During this period, as a prisoner at Hao Lo POW Prison, he was subjected to severe treatment at the hands of his North Vietnamese captors. As they persisted in their harsh treatment of him, he continued in his refusal to give out biographical data demanded by the North Vietnamese. He heroically resisted all attempts by his captors to break his resistance indicating his willingness to suffer any deprivation and torture to uphold the Code of Conduct. Through those means, he inspired other POW's to resist the enemy's efforts to demoralize and exploit them. By his gallantry and loyal devotion to duty, he reflected great credit upon himself and upheld the highest traditions of the Naval Service and the United States Armed Forces.